The Milton School Board is launching an investigation into stipends paid to district administrators. At their meeting Monday night, school board president Tom Westrick admitted making a mistake in unilaterally approving one specific payment to Milton superintendent Tim Schigur. 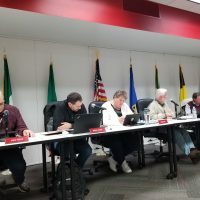 Board member Brian Kvapil raised the issue publicly late last week and called for an emergency board meeting that did not happen. He believes two other stipends were also paid out, with all three totaling over $30,000. Milton School District legal council Shana Lewis recommended that the school board hire an independent investigator to look into the other allegations raised by Kvapil, and the board took her suggestion. This controversy comes as the board prepares for Milton’s upcoming school referendum on the ballot in April.